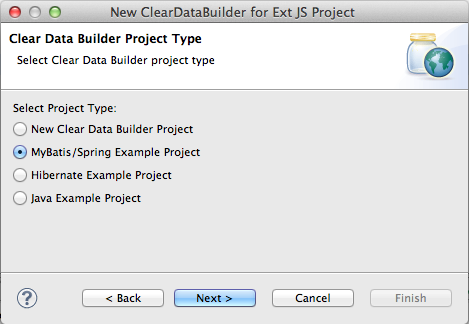 Clear Data Builder – Eclipse plugin that supports code generation ExtJS MVC artifacts based on Java code. 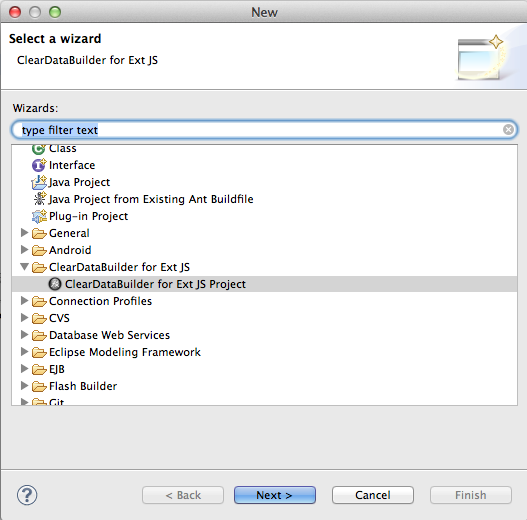 CDB comes with wizards to start new project with plain Java or with popular frameworks like Hibernate, Spring, MyBatis. Clear Runtime – Java components that implements server side part of ChangeObject, DirectOptions and etc. The phrase “to be more productive” means to write less code and produce the results faster. This is what CDB is for. In this article you’ll see how Clear Data Builder helps you to integrate the client side with the back end using the RPC style and how to implements data pagination for your application. 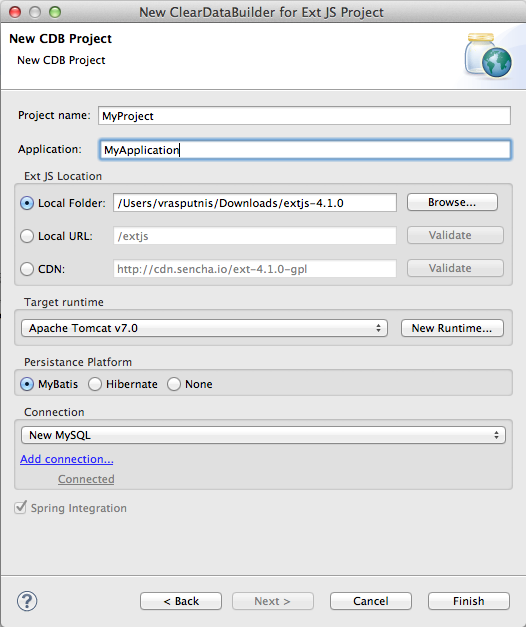 CDB distribution available as plug-in for Eclipse IDE. The current update site of CDB is located here. The current version is 4.1.4 (don’t be surprised – this is a five-year old code generator, and its previous versions were made for generating the UI for Adobe Flex framework). 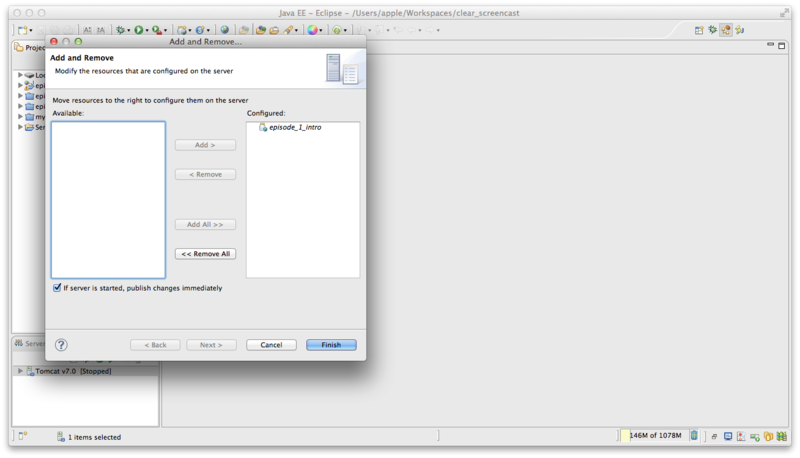 You can install this plug-in via Install New Software menu in Eclipse IDE. 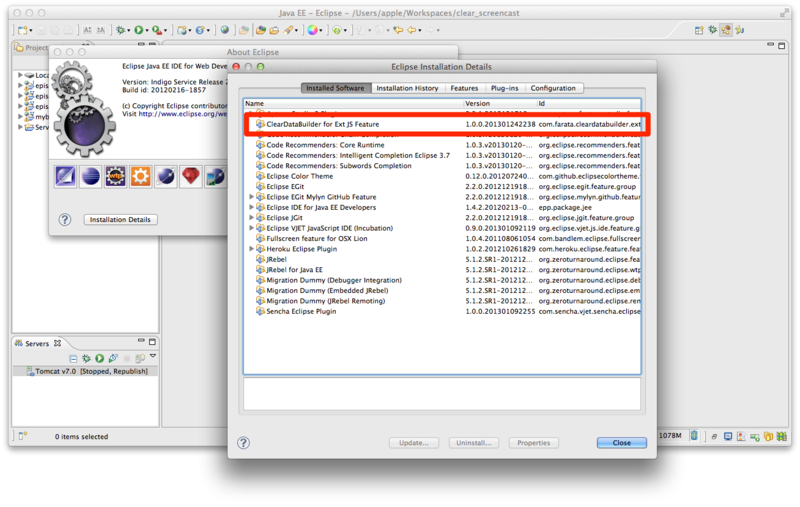 The [FIG-1] shows how you can validate plug-in installation. If you see “Clear Data Builder for Ext JS feature” in the list of Installed Software in your Eclipse IDE, you’re good to go. Important You have to have “Eclipse for Java EE Developers” installed, which includes the plugins for automation of the Web applications. Clear Data Builder comes with a set of prepared examples that demonstrate the integration with popular Java frameworks – MyBatis, Hibernate, and Spring. Also, a plain Java project example that doesn’t use any of the frameworks is available as well. Let’s start with the creation of the new project by selecting the menu File → New → Other → Clear, and then press Next. First of all let’s call the new project episode_1_intro. 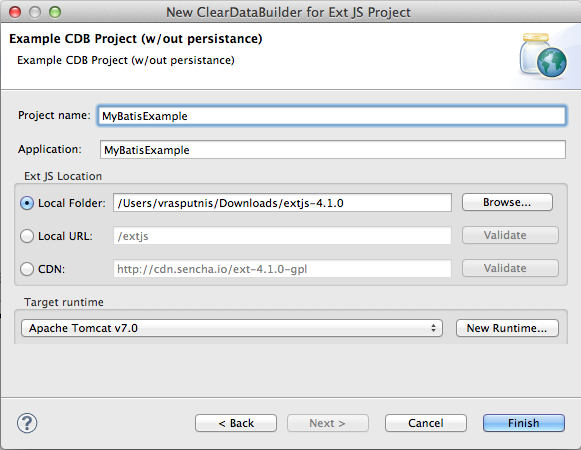 CDB supports different ways of linking the ExtJS framework to the application. In my case, I already have installed ExtJS libraries under my Web server (Apache Tomcat). We’re going to use this local ExtJS URL, but you can just specify any folder in your machine and CDB will copy the ExtJS file inside your project. Lastly, you can use ExtJS from the Sencha’s CDN, if you don’t want to store these libraries inside your project. 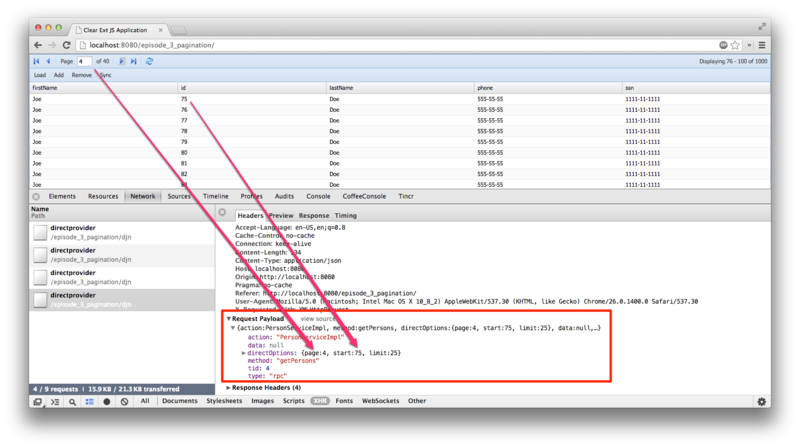 Besides, using a common CDN will allow Web browser to reuse the cached version of ExtJS. For this project we are not going to use any server-side (like MyBatis or Hibernate). Just click the button Finish. First of all, CDB will print some initial messages on the Eclipse console. When CDB runs for the first time it initializes directory structure in the WebContent folder. Inside the WebContent directory CDB creates directory structure which is recommended by Sencha for MVC applications. Also you’ll get the HTML wrapper – index.html – for this application, which contains the link to the entry point of our application. 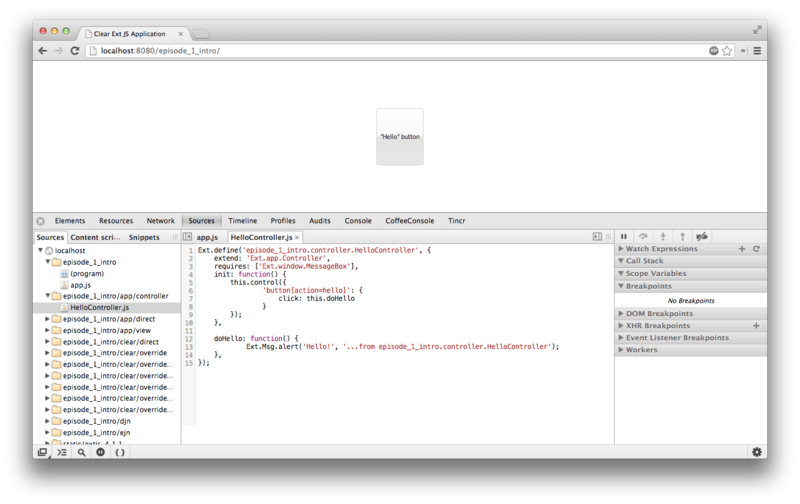 CDB generates an empty project with one sample controller and one view – Viewport.js. 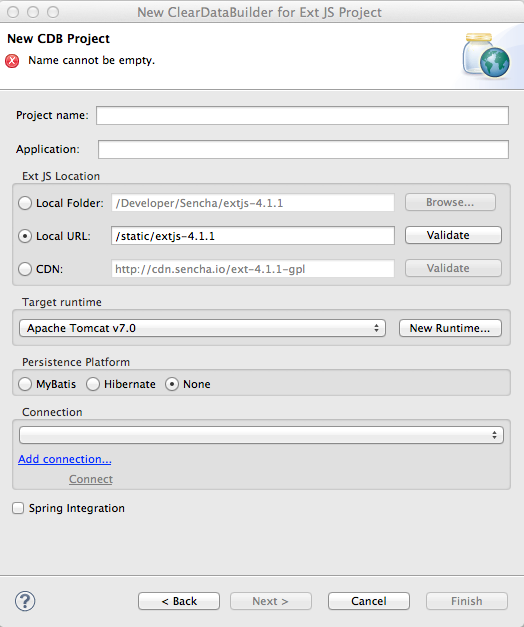 To run this application, you need to add the newly generated Dynamic Web Project to Tomcat and start the server (right-click on the Tomcat in the Servers view of Eclipse). Let me switch to web browser to open this application on http://localhost:8080/episode_1_intro . Voila! Just in couple minutes we’ve setup new Dynamic Web Project with the ExtJS framework support and one fancy button on UI. Now I need the same corresponding ExtJS model for my Person. Just annotate this class with the CDB annotation called @JSClass to ask CDB to generate the ExtJS model. As you can see Clear Data Builder generated two files as recommended by the Generation Gap pattern, which is about keeping the generated and handwritten parts separate by putting them in different classes linked by inheritance. Let’s open the person model. In our case the PersonModel.js is extended from the generated _PersonModel.js. Should we need to customize this class, we’ll do it inside the PersonModel.js, but this underscore-prefixed file will be regenerated each and every time when we change something in our model. CDB follows this pattern for all generated artifacts – Java services, ExtJS models and stores. This model contains all the fields from our Person DTO. 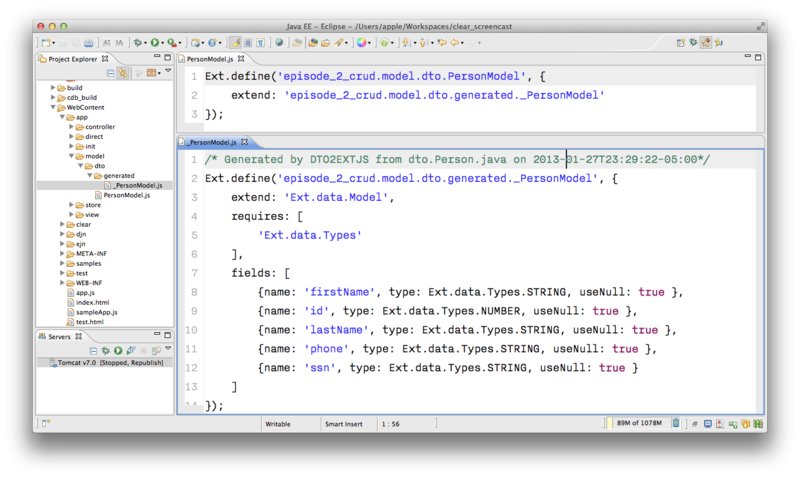 Now we need to create a Java service to populate the ExtJS store with the data. Let’s create an interface PersonService in the package service. This service will to return the list of persons. This interface contains one method –List<Person> getPersons(). I need to ask CDB to expose this service as a remote object, which is done by the annotation called @JSService. Another annotation @JSGenetareStore will instruct CDB to generate the store. In this case CDB will create the destination-aware store. This means that store will know from where to populate its content. All configurations of the store’s proxies will be handled by the code generator. With @JSFillMethod annotation we will identify our main read method (remember the “R” from CRUD). Also it would be nice to have some sort of UI to test the service – the annotation @JSGenerateSample will help here. CDB will examine the interface PersonService, and based on these annotations will generate all ExtJS MVC artifacts (models, views, controller) with the sample application. When the code generation is complete, you’ll get the implementation for the service – PersonServiceImpl. 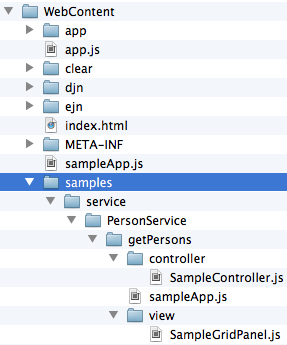 The store folder inside the application folder (WebContent\app) has the store, which is bound to the PersonModel. And my person model was generated previously. In this case, Clear Data Builder generated store that binds to the remote service. There is one more thing not to be missed – Clear Data Builder generated a UI for us! Check out the samples directory shown on [FIG-7]. Let’s return to the server side code. For services CDB also follows the Generation Gap Pattern and it generated stubs for the service methods. Override these methods when you’re ready to implement the CRUD functionality [LISTING_3]. 1. We need to extend the generated class and provide the actual implementation. 2. getPerson is our retrieve method (the R in CRUD) . 3. For this sample application we can use java.util.ArrayList class as in-memory server side storage of the Person objects. In real world applications you’d use a database or other persistent storage. 4. fillmethod+doCreate() is our create method (the C in CRUD). 5. fillmethod+doUpdate is our update method (the U in CRUD). 6. fillmethod+doDelete is our delete method (the D in CRUD). To demonstrate the rest of the CRUD methods we’ll ask the user to insert one new row, modify three existing ones and remove two rows using the generated Web client. The Clear.data.DirectStore object will automatically create a collection of six `ChangeObject`s – one to represent a new row, three to represent the modified ones, and two for the removed rows. When the user clicks on the Sync menu the changes will be sent to the corresponding do… remote method. When you sync() a standard Ext.data.DirectStore ExtJS is POST-ing new, modified and deleted items to the server. When the request is complete the server’s reply data is applied to the store, expecting that some items can be modified by the server. 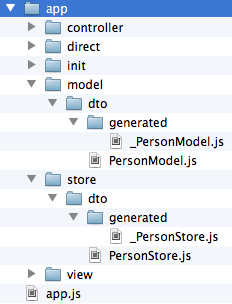 In case of Clear.data.DirectStore instead of passing around items, we pass the delta, wrapped in the ChangeObject. newVersion – it’s an instance of the newly inserted or modified item. On the Java side it’s available via getNewVersion(). prevVersion – it’s an instance of the deleted of old version of modified item. On the Java side it’s available via getPrevVersion(). The corresponding Java implementation of ChangeObject is available on the server side and Clear Toolkit passes ChangeObject instances to the appropriate do* method of the service class. Take a look at the getPersons_doCreate() method from [LISTING_3]. When the server needs to read the data arrived from the client your Java class has to invoke the method changeObject.getNewVersion(). This method will return the JSON object that you need to deserialize into the object Person. This is done in [LISTING_3] and looks like this. When the new version of the `Person` object is extracted from the `ChangeObject` you can do with it whatever has to be done to persist it in the appropriate storage. In our example we just print the new person information on the server-side Java console. This is why we said earlier, that it may be a good idea to provide a pretty printing feature on the class `Person` by overriding method `toString()`. Similarly, when you need to do a delete, the `changeObject.getPrevVersion()` would give you a person to be deleted. The Google Chrome Console shows that PersonStore was populated with one thousand records. Let’s add the pagination component using the Ext toolbarpaging component. Let’s add it to the file sampleApp.js [LISTING_5]. 1. Let’s manually instantiate this store – create a separate variable myStore for this store and with empty config object. 2. Adding the xtype pagingtoolbar to this component docked items property – I’d like to display the information and dock this element at the top. 3. Now the paging toolbar is also connected to same store. click of Load button [LISTING_6]. 1. We can bind the store instance to our grid panel. In controller’s refs property I’m referencing our simplegrid panel with ThePanel alias. 2. In this case I don’t need to explicitly retrieve the store instance by name. Instead, we can use getters getPanel() and getStore() automatically generated by the ExtJS framework. When the user clicks the button next or previous the method loadPage of the underlying store is called. Let’s examine the directprovider URL – server side router of remoting calls – and see how the direct request looks like. Open Google Chrome Developer Tools from the menu View → Developer, refresh the Web page and go to the Network tab. You’ll that each time the user clicks on the next or previous buttons on the pagination toolbar the component sends directOptions as a part of the request. Default Ext Direct request doesn’t carry any information about page size. Clear JS, the client side extension of the ExtJS framework, adds some extra functionality to Ext.data.DirectStore component to pass the page start and limit values to the server side. At this point, the directOptions request property shown in [FIG-9] can be extracted on the server side to get the information about the page’s boundaries. Let’s return to the code of PersonServiceImpl and add some extra code there. Right now the pagination doesn’t work. The server sends the entire thousand records, because the server is not aware that the data has to be paginated. We’ll fix it in [LISTING_7]. 1. On the server side there is a special object called DirectOptions, which comes with Clear Toolkit. 2. We’re interested in start and in limit options (see [FIG-9]). 3. Calculate the actual limit. Assign the size of the data collection to the limit variable if it’s less than the page size (start+limit). 4. Notify the component about the total number of elements on the server side by using DirectOptions.setOption() method with total option. 5. Before returning the result, create a subset, an actual page of data. In this case I need to use method of java.util.List.sublist() which produces the view of the portion of this list between indexes specified by the start and the limit parameters. As you can see from the Network tab in [FIG-8], we limited the data load to 25 elements per page. Clicking on next or previous buttons will get you only a page worth of data. The Google Chrome Developers Tools Network tab shows that that we are sending start and limit every time and our response contains object with 25 elements. The development of enterprise web application involves many steps that need to be done by developer. But with the right set of tools the repetitive steps can be automated. Remember the DRY principle – don’t repeat yourself. Try to do more with less efforts. I hope this article will help your to get started start with Clear Data Builder, which should make any ExtJS enterprise software developer more productive. Subscribe to our youtube channel to get access to the latest videos, screencasts and learning materials. You are invited to read our upcoming book “Enterprise Web Development” (work in progress) that includes coverage of ExtJS. ClearDataBuilder for Ext JS 4.1 has arrived! The URL for Eclipse plugin update is http://www.cleartoolkit.com/downloads/plugins/extjs/cleardatabuilder/4.1/site.xml. The wizard will present you just one dialog. That dialog will contain all settings your project needs. Let’s look at each of the project types one by one. This is the simplest project to setup and the dialog contains only two settings, which are required by all project types: Ext JS Location and Target Runtime. The first one lets you choose between embedding Ext JS inside your app or point to an external Ext JS URL. To embed Ext JS you select “Browse…” and navigate to Ext JS location on your hard drive. Alternatively you may point to a local URL on your own server or to a Sencha CDN. In the latter case you will be constrained to use production version of the Ext JS. The rest – deployment of the example sources is done automatically. 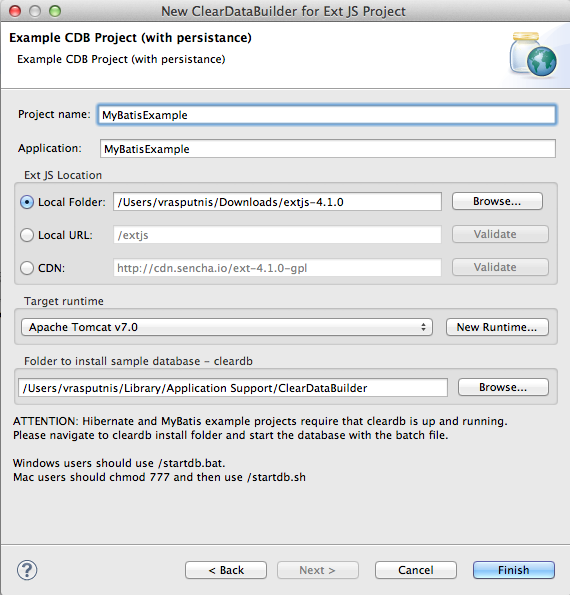 For regular projects you will have to select the persistence type: MyBatis, Hibernate or None. That’s it for now. I will be presenting the Ext JS 4.1 and CDB for ExtJS on the Fifth Annual Farata’s Symposium, so join us there. We are close to the beta release of the DTO2ExtJS code generator that automatically converts a Java DTO into Ext JS model. This will be of great help to fellow enterprise developers who use Ext.Direct to remote from Ext JS applications to Java classes in the servlet container. We use DirectJNgine. When Sencha releases an Ext JS implementation of AMF, models generated by our DTO2ExtJS will be used to remote to BlazeDS. As you can see, we keep using the generation gap pattern (the parent class gets regenerates, but the subclass doesn’t) to safely modify the extension and let us keep regenerating the bottom file of the pair, which we do every time the Java file is modified. If your Java class inherits from another one – make sure you annotate the parent as @JSClass and DTO2ExtJs generates models for both, or tell DTO2ExtJs to ignore the parent class entirely, and it’ll obey. You will be able to fully control the output location and naming of the generated models via APT parameters. We’ll demo the automatic Ext JS code generation at the end of our 2 day Ext JS workshop in June in New York CIty. Enter Victor as a promo code to get $100 off the price. 2. I didn’t properly configure the Java class/method so the front end didn’t even call it. 3. I didn’t code the database portion properly. The problem was that my project has two different versions of the class WrapperObject located in different packages! The superclass was using the WrapperObject from one package, but the subclass from another! This little annotation caught what my eyes didn’t see. Fixed the import statement in the subclass to properly override the method saveData, re-ran the program and got… an SQL error stating that I have an extra comma somewhere in my Insert statement. But this one is a piece of cake! I was so happy. Thank you Java @Override – you made my day!From now on I’ll be using this example in all my Java classes. Just finished going through the slide deck from the teleconference dated January 24, 2011. It was titled “Is Java A Dead End For Enterprise Application Development?” This document has been authored by Mike Gualtiery, Senior Analyst from Forrester. If the slide deck’s title has a question mark at the end, the author’s blog simply states that Java’s a dead end. Bashing Java is popular these days, but is it justified? I don’t believe so. Unfortunately, people who state that Java’s dead are not the people who use the latest Java technologies day in and day out. Sure enough, people are overwhelmed by the amount of news generated by iOS and Adnroid, while Java (the most popular programming language) gives a perception of a stagnating platform. But in this presentation the author made a number of statements that show that his perception of Java platform is based on the status of the platform several years ago. The main issue is that he’s not aware of how things are done in Java EE 6, which has been released more than a year ago. All accusations that Java developers have to use a “frameworks galore” slowly but surely becomes a history. I had a chance to learn it first hand while working on my Java book published earlier this month. I’m not going to bore you with Java code, but it’s really easy now. The statement of the Forrester’s analyst that “Java was not designed to increase productivity of business application” doesn’t bear much weight after you look at the code samples above. Java EE 6 doesn’t stand on the way of application developers. Just put your business logic in the sayHello() method with no or minimum boilerplate code to add. The author correctly blames Java Swing for being overly complex and JavaFX for failing to present a competitive product. Today this is true. But this is just a small part of a solid platform that enterprises rely upon during the last decade. Mr. Gualtiery suggests using “better alternatives” as he put it. Namely, Business Process Management (BPM) tools, BI, Business rules management systems. He forgot to mention though, that you’d need to rob a bank first to acquire them. And after this part is done, you’ll still need to do some scripting plus a lot of voodoo dancing around these generic packages to make sure that they perform well with YOUR business application. He claims that “Newer programming languages are designed to make certain apps easier”. Guess what’s the name of this new language? Ruby on Rails. First, this is not a language, but a 7-year old Web-application framework. Second, during all these years it was not able to become a noticeable tool in the enterprise development field. The author also mentions some other programming languages forgetting to mention that they run on Java Virtual Machine (JVM), which has been greatly improved over the past years. The last couple of slides contain recommendations. The author claims, “If you are using Java successfully, there is no reason to abandon the ship right away”. Thank you very much! And then, “If you are using Java unsuccessfully, then look first at your software development life cycle… The platform you use is only as good as people and process…” I can’t agree more. If your organization is full of mediocre software developers, switching Java to any other tool or programming language won’t make a difference. Here’s yet another vague recommendation “Don’t think how you can develop Java applications faster. Instead, think how you can develop applications faster. This opens your mind to look outside Java to these alternatives.” I wonder, how much Forrester charges for this report? Disclaimer. The next verse has been written neither by me nor by the Senior Analyst from Forrester.